At Perfect Image, we can provide photo retouching and photo restoration services that will bring your aged and damaged photographs back to life. Starting with an original photo, no matter what the condition, our photo retouching service can breathe new life into antique images and restore even the most damaged photographs. No matter if your original photo has faded, cracked or even been water damaged – through the magic of modern-day image editing technology we can restore just about any image to its former glory. In the process we’ll digitize the image and help you archive it for long-term safe keeping. In order to accomplish this our technicians aren’t just computer-savvy. They’re artists, trained photographers and photographic experts who have seen it all. They know how to bring out just the right skin tones and make a faded sunset look spectacular once again. Let us help you bring your cherished photos back to life! 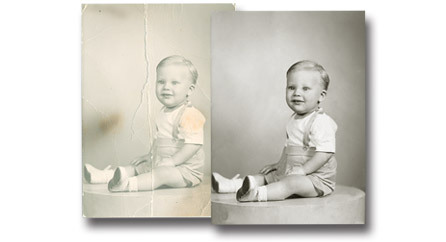 If you have questions about our photo restoration services please contact us today. We’ll do our best to help you in any way we can.